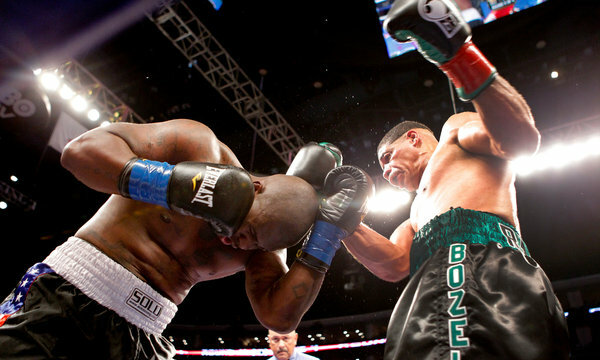 Four rounds in a boxing ring could not undo 26 years in prison, but Dewey Bozella made the most of them, winning a unanimous decision Saturday at the Staples Center in Los Angeles in what he says will be his only professional fight. Mr. Bozella, making his professional debut at the age of 52, two years after being exonerated of the 1977 murder of a 92-year-old woman in Poughkeepsie, N.Y., started slow but then outpunched and outworked his opponent, Larry Hopkins, 30, of Houston, in a cruiserweight bout. Mr. Bozella has gained an unlikely degree of celebrity since he walked out of a Poughkeepsie courthouse into a cold rain, a free man at last, on Oct. 28, 2009. He was convicted in 1983 of killing Emma Crapser and then convicted a second time in 1990 after turning down a deal that would have let him leave prison if he only confessed to the crime. The discovery in 2008 of the file of the Poughkeepsie police lieutenant who had investigated the case revealed substantial exculpatory evidence that was never turned over to Mr. Bozella’s lawyers, finally leading to his exoneration.